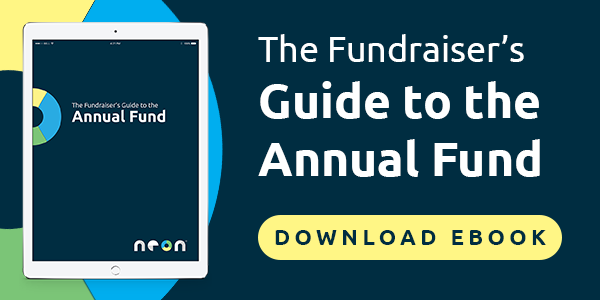 FREE BONUS: Download our accompanying Annual Fundraising Ebook. Easily save it on your computer for later reference, or print it to have a copy to take with you. Stewardship is a buzz word that needs to be explored further. At its core, it is the management of your donors and making sure they feel rewarded for their donations, and this is the key to the success of your annual fund. When a donor feels acknowledged they are more likely to donate again and tell others about their donation. Your database can ensure that immediate stewardship is handled well, while also giving you tools to do follow up that fits within your overall annual fund plan. Thanking your donors falls into two key categories: tax receipts and personal satisfaction with your organization. One of the key reasons that folks donate is due to the deductions they receive for supporting your organization. The other is the personal reason why they have chosen to donate to your cause. Stewardship can cover both of these in one fell swoop. You should be thanking your donors immediately and accurately. You can also encourage them to manage their donations over time, make recurring donations, or to make big donations immediately. No matter what, you should be crafting thank you acknowledgements that reinforce your mission and why the donor made their commitment in the first place. You should be thanking your donors the moment they hit submit on your donation forms. The easier you make the donations process for donations on all levels, the less staff time you’ll spend doing paperwork catch up. The more personalized your donation thank you emails are, the greater the chance that you’ll stand out from the crowd. I’m on the board of directors for NeonCRM client Reading With Pictures and we’ve crafted our system emails to include donation information, our mission statement, and information that can double as a tax receipt. Your organization can easily create automated emails that can take the workload off your development personnel. Furthermore, you can create conditional emails that generate a thank you acknowledgement based on which campaign (or child campaign) a donor gave toward. This can help automate the stewardship process, even when donations are entered in the back end individually or via batch donation. When I worked for my private school, our donation thank you process had a policy that all gifts would have a written letter from the head of our school within 48 hours. That meant we needed to generate mail merges the day of a donation. A best practice is to process, track, and follow up on all your donations from a physical mailing standpoint as quickly as possible. Services like Click2Mail can even print, seal, stamp, and send your letters for you. Ensuring that your donors are properly thanked is a great way to encourage them to come back, year after year. Your annual fund should never be treated as a one-off donation but as a way to continually engage the folks most engaged with your mission. A physical mailing is a great way to do this, since you can add personalized notes that an automated email won’t be able to express. There is no better way to thank your donors than an actual conversation. Generating a saved report of folks to call will speed up this process greatly, instead of running a new report each time. While we’ll be covering your major donors in a future blog post you can start the immediate stewardship process by creating a contact report on major donors with phone numbers, total donation amount, and last donation amount as outputs. That way your development focused staff members or members of your committee can make calls based on up to date donation history to express a sincere “Thank You”. When at the private school I was raising funds for, we had a policy to call any donor over $1000. Why not create a report to see those donations and combine it with any prospecting/activities functionality your database has? This can help you to track the progress, timing, and history of these important phone calls. Or ensure that those folks who donate more are covered on a basic level by a specialized segmented email thank you communications for donors who give larger amounts? These are small yet important ways you can ensure that stewardship is a key component of your annual fund. Next time we’ll explain how to put together an end of the year appeal – perfect timing too! For more information about annual giving, check out our long-form guide to annual giving and fundraising. Tim Sarrantonio is a team member at NeonCRM and has more than 10 years of experience working for and volunteering with nonprofits. He has raised over $3 million for various causes, engaged and enhanced databases of all sizes, procured multiple successful grants, and formulated innovative communications and fundraising campaigns for several nonprofits. A two time TEDx speaker, he has been invited to speak at numerous Association of Fundraising Professionals conferences, the Nonprofit Technology Conference, and for internationally recognized nonprofit leaders like GuideStar and Chronicle of Philanthropy. He volunteers heavily in his home of Niskayuna, NY.